When I first got into the fountain pen hobby about a year ago, an A5 sized, clothbound, Back to Basics 1951 notebook from Clairefontaine was my first accessory purchase. I've subsequently gone through two of these 96-sheet, college ruled notebooks while testing pens and inks and am working on a third such journal of experimentation. So, it is high time I post up a review. Clairefontaine, a French paper company, makes these notebooks with their fantastic Papier Velouté at a very reasonable cost versus other premium notebooks. The A5 size runs around $7-10 and the notebooks come in several pleasant colors including a dark grey, turquoise, royal blue, dark blue, orange, lime green, fuschia, and probably others I'm unaware of. Papier Velouté is a crisp white and smooth, offering a pleasant, gliding feeling even for nibs with considerable feedback, low flow, and inks lacking lubrication. Nibs always seem to feel best on this above other papers I have tried. In fact, I get a false sense of success testing nibs I have attempted to tune and smooth until I try them on lesser paper! Inks tend to dry more quickly, too, often an indicator of absorbency. Yet the paper also resists feathering for nearly all of the most feather-prone inks I have tested. The 90gsm weight is very resistant to show-through and bleed-through except for a few cases with an extremely dark ink and overly wet pen. Also noteworthy is that my dip pens, usually needlepoint Esterbrook 048 pens (I don't do calligraphy) work wonderfully in these notebooks with Speedball black. The binding and cardboard has held up to months-long use. The spine will tend to arch during that time and the cardboard isn't thick enough to totally prevent curling but they close well enough, for me at least, by the end of their use. Also, thanks to the cloth binding, the notebooks open wide and flat without breaking the spine which makes it easier to write on both sides of the page. In all these are outstanding notebooks at an acceptable price and I would recommend them to anyone looking for a soft bound, lined notebook. Thank you for this review. I've often looked at these notebooks. Now I know how good they are. 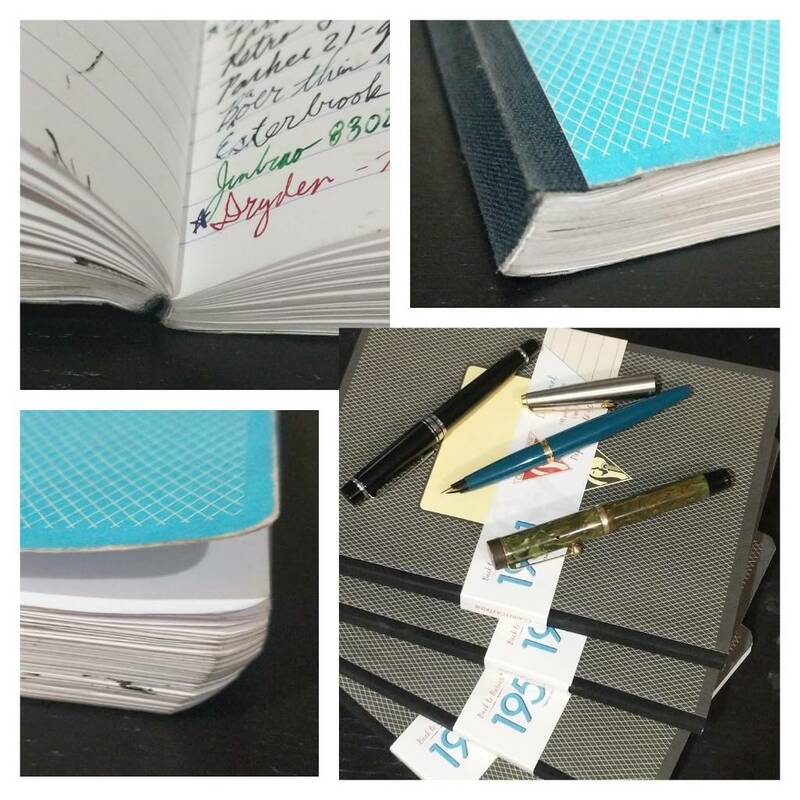 I've been using Clairefontaine notebooks for years, in various sizes. Even cutting down the small ones (90 x 140) to fit Midori passport covers. Great paper and the spiral bound A5 sized ones are good for ink logs too. Same here, but I HATE the Rhodia web notebook. It took me a little while to figure why the ink colors were so wonky. The paper is "Ivory" or cream colored, not pure white. Just enough color to throw off what the ink really looks like on pure white paper. Switched to Rhodia Ice pads in A4 size and problem was solved. Now I'll have to grab a Clairefontaine 1951 to test out. Another +1 on these Clairefontaine 1951 notebooks. I bought one just because it would open flat and was available with a green cover and binding (I like green). Been using it for a while now. It's always in my backpack to jot down non-work related thoughts while I'm at the office. I have a small pocket sized version of these, and it's a good, well made pad, which behaves well with my pens and inks. I'll certainly be buying these again. I have used the A5 size of these excelent note books for keeping my pen record, inks used etc including all purchase information, which itself is interesting provided one doesn’t attempt to count total cost.The strong elastic band which keeps everything in order and stands the test of time and the excellent index pages also help keep everything easily accessable. Altogether an excellent product costing in the uk anout £14 but well worth the cost. I must indeed be talking about a different notebook. Mine is the Clairefontaine Age Bag A5 threadbound notebook and does cost £14 or a little more from amazon. My book has 186 numbered pages plus 8 index pages, It also has a flap on the back of the front and rear covers to hold loose pieces of paper. The covers are available in several colours. The ruled pages are very fountain pen friendly. Sorry for causing some confusion. No apology required, but after reading this thread I had already put a Clairefontaine 1951 Back to Basics notebook in my cart on Amazon, so I knew the price.